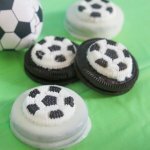 Soccer Oreos are cute and easy to make for a kids soccer birthday party, after-game snack, or soccer themed lunch. Place the candy melts and shortening in the microwave-safe bowl and heat for 20 seconds. Stir well and reheat, continuing to heat and stir until the candy melts are smooth and no lumps remain. Using a fork, dip each Oreo into the white chocolate coating and then flip to coat the other side. Hold the Oreo above the bowl to allow excess chocolate to stream off before placing on the lined baking sheets. While the chocolate or candy coating is still wet, place the soccer candy in the center of the Oreo. Repeat with half of the remaining Oreos. Set in the fridge for 1 hour to fully dry. With the Oreos that you are leaving plain, just dab a bit of chocolate to the back of the candies to attach them to the Oreos.